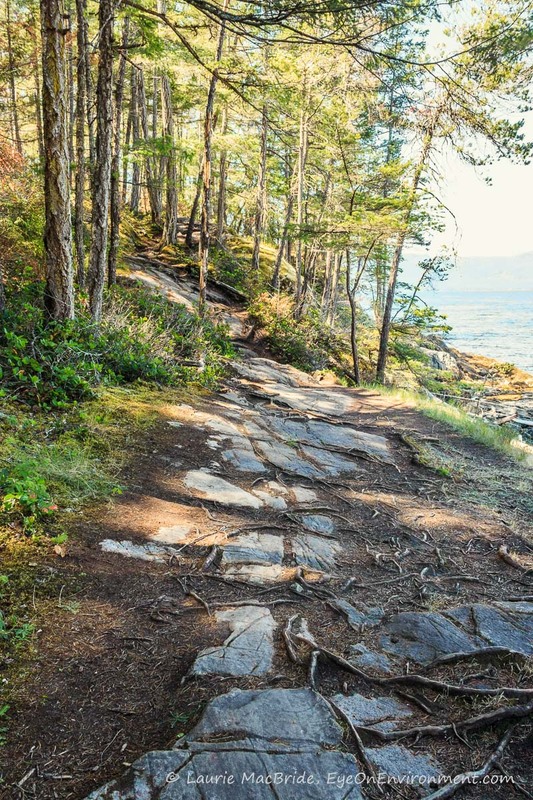 On a dry day, Francis Point Provincial Park on BC’s Sunshine Coast provides a good opportunity for boaters whose legs are itching for exercise – as ours were this past summer, when we set out to walk there from our anchorage in Gerrans Bay, about a mile away in Pender Harbour. 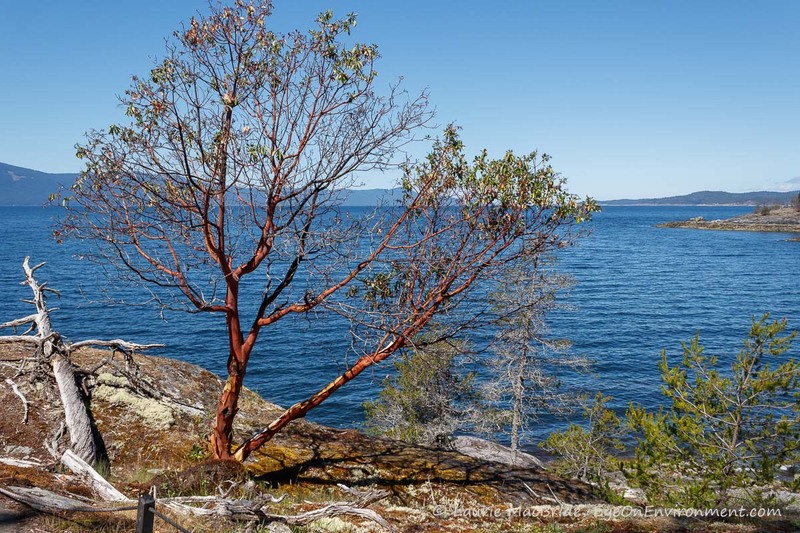 The day was hot, the skies were clear, and once we reached the shoreline portion of the trail, the views across to Texada Island (photo above) and north up Malaspina Strait (below) were glorious. But despite the vista on offer to me as a photographer, I found myself looking straight down more often than through my viewfinder. I was glad we’d worn decent footwear, as this was definitely not a time for sandals or flip flops. Staying on the trail wasn’t easy. It wound in and out of the woods, creating a mosaic of eye-challenging light and shade that complicated our maneuvers over areas of loose stone. 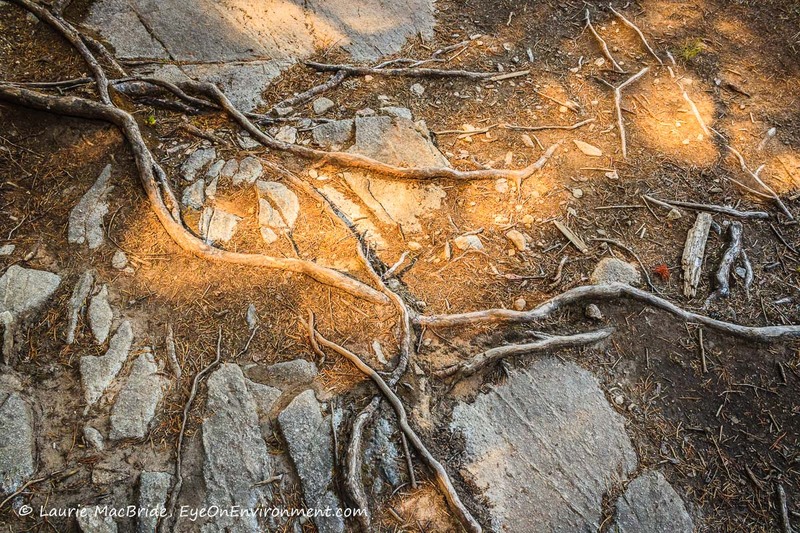 In numerous places the path seemed to diverge or vanish, and the rocky bluff we walked along was steep at times. After stumbling along for about 45 minutes we stopped to ask a younger, more energetic hiker how much further it was to Francis Point. He said it would only take us a few more minutes, and that we should persist – that what we’d find at the end of the trail would make the walk worthwhile. He was right, it turned out – as I’ll show you in my next post. 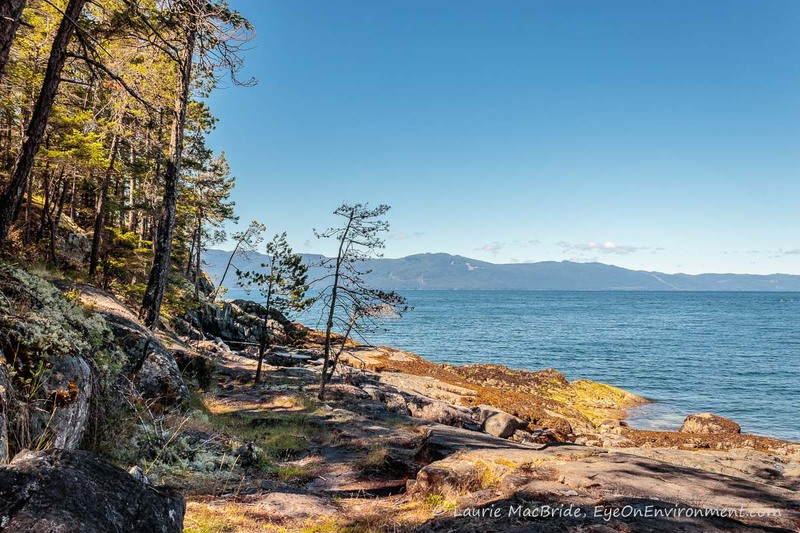 Posted by Laurie MacBride, Eye on Environment on November 29, 2018 in South Coast & Vancouver Island and tagged beauty, boating, nature, photos, places, shoreline, summer, Sunshine Coast. Great photos as ever. One of my old haunts was Bargain Harbour, just around the corner. Yes, we’ve stayed there too – great anchorage in a NW wind. This time we stayed in Gerrans and paddled through, under the highway bridge, to Bargain (not on the same day we walked to/from Francis Point – that was more than enough exercise for our aging bodies that day!) Thanks for the comment, Fred.